The aircraft, Albemarle Mk.II V1604 of No.42 Operational Training Unit had taken off from Ashbourne at 23:42 on the 11th March 1944 on a cross country flight. After some 3 and a half hours the aircraft returned to the airfield and requested that the flood lights be turned on to illuminate the runway for landing. Shortly afterwards at 03:14 on the 12th March the aircraft dived into the ground at high speed near Bradley about 1.5 miles to the north east of the airfield killing all of the crew and destroying the aircraft. 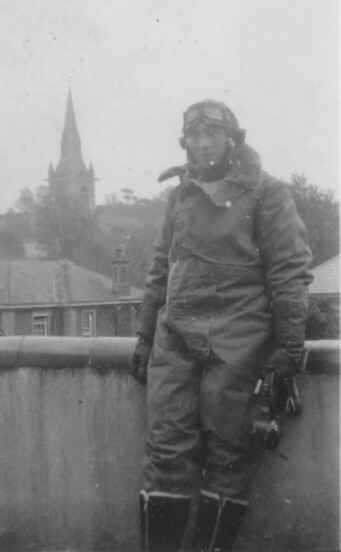 Above is the aircraft’s navigator Willie Van Leemputten, seen in flying kit during his training, thanks to William Van Leemputten for the photograph. 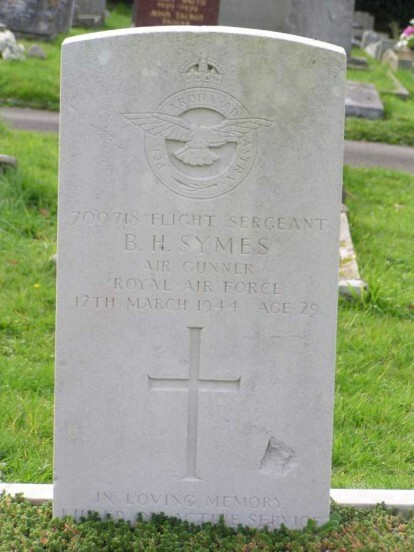 The five crew were buried at cemeteries across Great Britain, below is a photograph of Flt Sgt B. Symes’ grave at Poole (Parkstone) Cemetery, kindly supplied by The British War Memorial Project and take by Vernon Masterman. 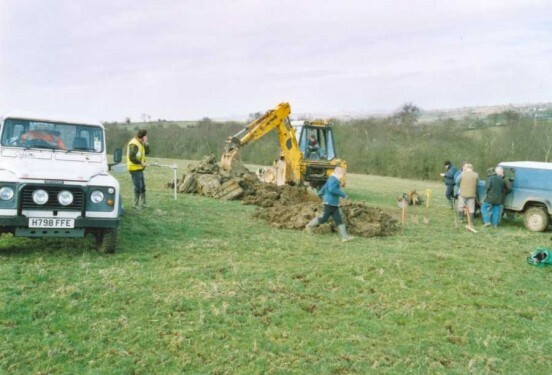 On the 5th March 2005 we carried out our first excavation near to Ashbourne on the southern boundary of the Peak District. 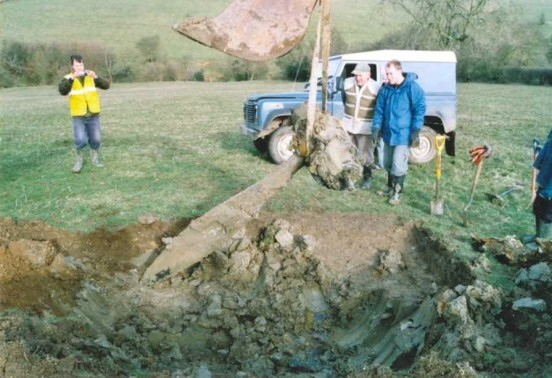 Apparently much of the aircraft was recovered at the time so when we first visited the site in mid 2004 we did not expect to find much. 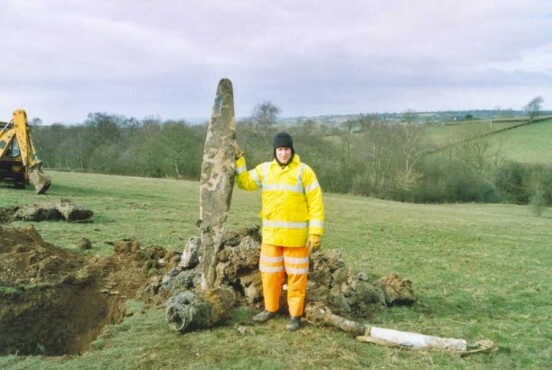 However one metal detector contact continued to grow until it was obvious that we had discovered a propeller boss, we returned at a later date with Nick Wotherspoon of L.A.I.T. to carry out a full investigation of the site with a Fisher Two Box, after this it was decided that a full excavation would be suitable and a licence was applied for. 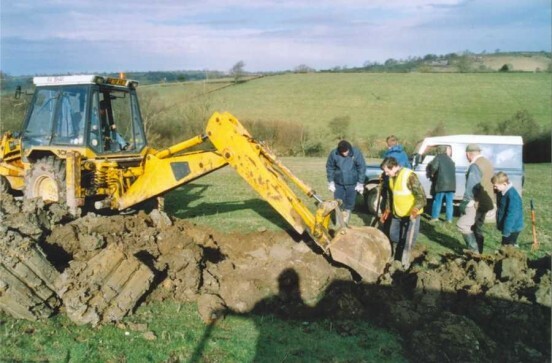 The excavation was carried out on a cold Saturday morning in early March 2005, with the aid of a JCB. The machine quickly had the propeller boss, (found during the initial survey of the site) still complete with a single blade and the engine reduction gearing attached, uncovered and shortly after, this item was lifted. A second hole was opened up a short distance away, this yielded a large amount of burnt material before apparently clean boulder clay was encountered. However the JCB hit a reasonable sized item within the clay, this turned out to be the remains of the nose wheel oleo. Also a large quantity of smaller items (including stainless steel frame work from around the cockpit) were recovered. The amount of items recovered did indeed show that an extensive clear up had taken place almost exactly 61 years earlier. The damage, or lack of, to the propeller possibly indicates that the engine driving was turning at a low rate. From its position relative to the other wreckage this was probably from the starboard engine. If anyone has wondered, the propeller stands over 7 feet tall, Alan is 6′ 2 1/2″ when wearing boots.